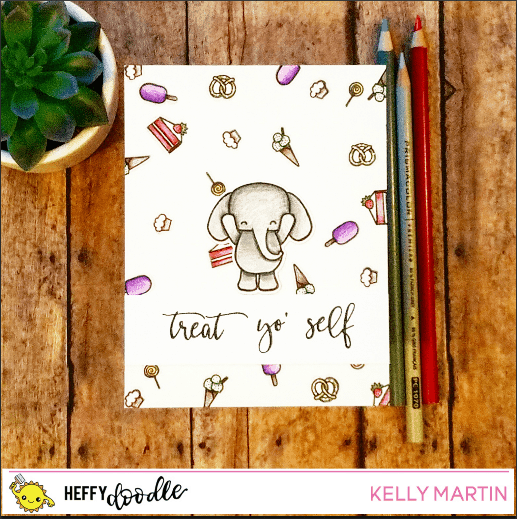 My name is Kelly and I'm super excited to be over on the Heffy Doodle blog for my first blog post as a design team member! I was so honored to be invited to be a part of the design team, and I'm excited to see how I'm going to grow in my skills as a crafter while working with these other amazing folks! For a closer look at my work, head here to my instagram account. Today I'm sharing this fun card full of some of my favorite things--TREATS!!! If you look closely. you'll see that they are mostly sweet treats, with the exception of my all time favorite snack: pretzels!! I decided to break out my colored pencils since I wanted to color these images as soon as I stamped them, and I didn't want to take the time to heat set the images or wait for them to dry on their own before I started coloring. Colored pencils are the perfect medium to use when you're wanting to stamp and then color immediately because you won't run the risk of the black ink bleeding into the rest of your images if you were to use markers or water coloring mediums. I used several of the small treat images from the Ad-roar-able lion stamp set and then an additional image from the Happy Snappy Crocs stamp set to create my background. I stamped the images multiple times in black ink and then used my prismacolor colored pencils to bring the images to life! I then used the Concord and 9th perfectly penned stamp set to stamp out the sentiment strip and then I glued it to my card panel. I then colored one of the elephant images from the Elephant of Surprise stamp set and glued it on top of the sentiment strip to finish off the card! Great card, the treats background is great, the card has a nice clean look.